Is Messi only candidate for Ballon d'Or? 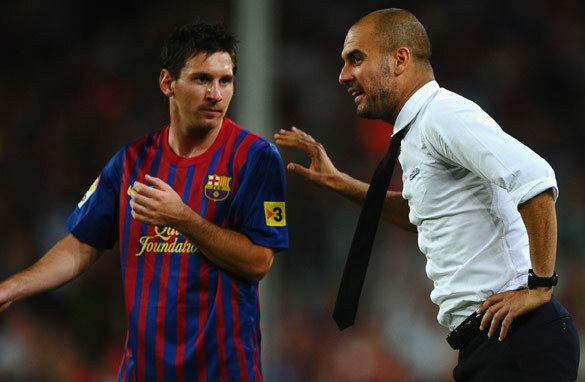 Will Barcelona star Lionel Messi and team coach Josep Guardiola be named the world's best in January? There is little doubt in my mind that Leo Messi will be the FIFA Ballon d'Or winner when the award is handed out in Zurich in January of next year. As much as it would be interesting to speculate about who else could win it, there is no point. There are a lot of fantastic footballers in the list of finalists unveiled on Tuesday, but Messi is the master. This is a man who is head and shoulders above everyone else in the world of football right now. This is someone who is probably, along with Diego Maradona, Pele and Zinedine Zidane, one of the best players who has ever walked the earth. He may be little, but any player wanting to wrestle the award away from him any time soon is going to have a tough time. As a matter of fact, arguably his closest competitor is Messi’s Barcelona teammate Xavi. Considering he led Spain to their first ever World Cup title last year, the midfielder should have been crowned the best player in the world in 2010. I have been a long time admirer of the playmaker’s skills and believe he should have won at least one individual award over the last couple of years. However, it is easy to understand why he didn’t. After all, he has a much flashier teammate who scores bags of goals every single year, so it was always going to be tough for him to come out on top. What about Cristiano Ronaldo, you ask? Well he is a phenomenal footballer, but the fact that Real Madrid have been playing second fiddle to Barcelona for the last few years, means he doesn’t have much of a chance to win the award right now. I know Cristiano reasonably well and I know he wants to be the best player in the world so badly it hurts. That’s why he arrives early and leaves training late so often. That’s why he has worked so hard on his body to become not only a gifted footballer but a powerful athlete as well. What I think is missing from Ronaldo’s CV is a career-defining goal. Messi had the slalom against Getafe a few years ago in the cup. He has since scored some unbelievable solo goals while Ronaldo has become more of a finisher who, though deadly, does not dribble as much or as well as the little Argentine. As far as the prize for best coach in the world is concerned, that has to go to Pep Guardiola, hasn’t it? It’s not what Barcelona win, it’s how they win it – with a brand of football that leaves everyone hypnotized. Pass after pass after pass and before you know it, the ball is in the back of the net. In my mind this is the best team the world has ever seen, and Guardiola has to get a lot of credit for their acheivements. I can’t wait to see him at another club. This might be his last season at the Camp Nou and it will be curious to see whether he can adapt to a different philosophy of football, or press his way of thinking onto another club. For now Messi is the only candidate for Ballon d'Or and no one else can take that from Him. Mark my words, he's going to take it four to five times back to back! Messi is the best. However, the second one this year should be the young star from Santos, Neymar. Messi plays well only in Barcelona, but without their Barça teammates, his soccer does not shine in the Argentina team. Neymar is carrying alone Santos and Brazil team in his shoulder. Santos is in a intermediate position in Brazil league because Neymar did not play in almost half of Santos games this year – part of time being in Brazil team, part of time not in the Brazil league b/c of Libertadores Championship. I am yet to see Messi's greatness.. I want to see him play at the same level with the Agentines's national team.. See it is easy to be great when you are surround by other great players! Please can you name any contribution Messi has made for Argentine?or the award is judged by club perfomance? Well I am from Uruguay, and even though I loved seeing Uruguay beat Argentina and take the south american cup, I must admit that Messi alone made Uruguay dizzy, and didn't win the game for Argentina because, well, it is Uruguay. If someone cannot see the greatness of Leo, I highly recommend a good eye checkup. Messi is a gift for football lovers, like none else today, except to a little smaller level, Xavi and certainly Iniesta. @Helio..........Neymar carried Brazil on his shoulder..hahahaha Joke of the century..From which Planet you just landed ? 80 percent of the footballers on this list shouldn't be on it. Abidal, really! I know the poor fella recovered from cancer, but still, get a grip. The problem is, since the ballon d'or and FIFA have joined up, the award has lost credibility. Ballon d'or award had integrity, FIFA was purely commercial. People listen, Messi is great even in Argentina national team. Goal scoring can sometimes make you believe other wise. But the fact is Higuain, Tevez, Di Maria and Heinze as well are not at the same level of Messi. So many great passes Messi gives but they do not gel together. Messi does not just score but as well is a great passer and assist man. He may not win a WC, but soccer is a team sport more then others. Argentina at this time does not possess players that are capable of carrying the National team to a WC. Is this award for the best player playing in Europe? Because if it includes the whole world Messi should be second, right after Neymar. Neymar is a nineteen-year-old player who plays for Santos in the Brazilian League. Most of you will have the chance to see him against Barcelona at the end of the year. I do not know, Huh? Neymar, the Santos Football Club is coveted by Barcelona and Real Madrid. is undoubtedly one of the biggest revelations of football since last year. Xavi has been great and consistent for longer than Messi, and, unlike Lionel, he performs just as well for his national team as he does for his club. Messi is a flair player and a goalscorer so obviously he draws the spotlight but he clearly can't deliver without the kind of service a player like Xavi supplies. That's why I think the whole notion of a world player of the year is a complete nonsense. The team of the year award is far more valid because it recognises that no man is an island in football and compares like with like, i.e defenders against defenders, attackers against attackers etc. No doubting Messi is great, but, as yet, he's by no means as influential as Pele, Maradona or Zidane were in my book and he's also nowhere near as clinical as Brazil's Ronaldo in his prime. The term "great" is therefore only relative to the era he's playing in, and in part is a product of the massive amounts of hype he receives as the goalscorer for a truly great TEAM!...As such he's eye-catching and I can see why you think he's the only player of the year candidate, but I do have to take issue with Ronaldo being a lesser player because, in your view, he has not scored a "career defining goal." It's a pure judgement call as to whether any of his best goals for Real Madrid or Manchester United have been career-defining. If you like the mazy dribble and cute finish clearly Messi has the edge, but if you prefer physics-defying shots from a dead ball or open play or a even headers (from which Messi rarely scores) then Ronaldo is by far the more complete player. Of course, he doesn't play for the most succesful team, which brings me back to my point, whoever wins the award is the beneficiary of the other players considerable effort and the tactical skills of the coach (and Guardiola can be the only winner of that award), consequently crowning one man as FIFA World Player of the Year is rather like licking the icing but ignoring the cake. Ronaldo broke the La Liga scoring record.. How is that not of MASSIVE note here. hahahahah Ronaldo supporters need to just drop it, he's good but he is not one of the best to ever play the game. Messi is, its undisputed, Lionel Messi will win the Ballon d'Or for the third year in a row. No. Question. Neymar? Are you all joking? He is a punk who goes to ground more easily than any player in Europe. Believe me, Santos will not make it to the FIFA Club World Cup final to face Barça. While I will always support Real Madrid, Messi deserves this award, hands down. Messi is a great football player! 2) In his actual role. He has not showed to be the best in the world in othre teams or not even in his country selection. Players like Zidane, etc. who have showed and prooven theirselves as the best in the world throughout playing in different Leagues, in different countries and with his own countries... THOSE ARE THE BEST! Messi is GREAT, but again, ONLY shown and demonstrated on a stable way in ONE TEAMA... thats not THE WORLD. Sells billions directly and indirectly! But thats not enough to name him BEST IN THE WORLD. Remember the real BEST players in the world, how they showed the world they were! Being a Dutchman, and giving the fact that Sneijder was blatantly robbed last year, I hope Van Persie keeps up his current form and nicks it. Pedro i think that messi as averybody knows is gona win the prize. But i think that the best coach needs to go to Tabares Uruguay coach, who is teaching how get a national team..
Messi, if he wins the 3rd, will be the only footballer NOT to have won a world cup. @brian – I came from Itaquera Planet. I support a small club of Brazil – named Corinthians, and I am tired of seing my club being massacred by Pele, Robinho and now, Neymar. Unfortunately, Corinthians will lose the Brazil League this year b/c we lost for Santos AGAIN 3 x 1 @ home. I think Tevez and Jorge Henrique are better players than Neymar, but once they are not in the list, my vote is for Messi. Have you ever heard about Neymar, from Santos club, Sao Paulo, Brazil? Oh My God! How come Neymar was never mentioned, in your article above. I'm lliterally in shock. Neymar is only 19 years old and is closer to his 100th gol in the near future. I find it funny that most people who say he doesn't perform for argentina probably don't watch argentina. Watch a game and then tell me he doesn't play great. There is only so much you can do with a mediocre team. Which is exactly what the Argentina team is. The only players that are good are in the attack...The midfield is non existent and the defense is one of the worst i have ever seen. You cannot win games with just an attack. if the defense and the midfield cannot distribute balls further up the pitch and always lose the ball then the attack cannot do anything. Messi has to be a playmaker in Argentina. He always drops deep to go get the ball himself...which is why he has 3 goals and 10 assists in 11 games for Argentina this year. The attack cannot do anything without him starting something by going to get the ball himself. And were it not for the fact that the likes of Higuain and Di Maria are usually wasteful, messi would have much more assists to his name. Zidane, Pele, Ronaldo (brazil)...they all had world class players around them. No one can say otherwise. And Maradonna had average players around him but his argentina team didn't have such a horrible defense that would let in 4 goals in one game. Name me one great midfielder or defender in Argentina right now. Pastore doesn't count cause they never play him. Mascherano is a defensive midfielder whose job isn't really to provide balls forward but rather to defend. No player can be successful with such a team. Give Messi a decent midfield and defense and he'll do wonders. He cannot defend, assist and score at the same time...it's not his job to do all of that. Messi is one hell of a player no doubt, but hes still to show that hes every bit as good when hes not in his beloved barca team where the concept is the biggest driving force.. but a messi in another team and hes just a good player.. for winning ballon d'ors en masse he should at least turn it on with his national team.. give it to ronaldo this time, look at his scoresheat man! even more than messi and he didnt even win the league..
@Steve: There's a team of the year award. Its called the champions league you moron. This is an award for the player that was crucial to his TEAM'S sucess. That's why the winner usually is from the team that won the CL that year. Oh yeah, and Messi is the gretest player of all time. I'm from Indonesia. I think the best player is Puyol, coz, He ever got the world cup, help the barca won several championship. he is good in defense but also good in attack. why FIFA and ballon d'or always choose the striker? I think that many times club performance outweighs country performance. When I remember greats like Pele, Ronald Da Lima, Michel Platini, Yohan Cruff< etc, I shudder to think that a good player such as Messi should even be referred in the same breath. There is no argument that Messi is very Messimerising when he plays. But his is just a poor player for his country. What FIFA should do is allocate points to be won by cups and tournaments. a club tounament just can't take 50% of the points. Instead 50% should go to country performance and the other 50% should be shared by other tournaments. That way, we shall be able to determine who is actually the best player, most influential. To me it is Messi's teammates at Barca who deserve this award more than him. When they don't play, he is a no body. Period! Of course Messi deserves the Ballon D'or one more time. Messi plays very well in Argentina National Team as well. But Argentina National Team is so poor than Barcelona so that Messi is inadequate to win lonely. those who say Messi is not good in the Argentine team, pls take time and watch a match in which Messi played. Argentina basically has no denfence and Messi does not play top in Argentina. if he doesn't perform, how come he has the most assists in the team. He doesn't need to play midfield in Barca because there are good players there already. He just needs a descent midfield and if not for Higuain, he should be made the main striker. Messi seems like the best because there are no other great players in this era. Just compared to the 90s (early 2000's) when the likes of el fenomeno, Ronaldinho, Zidane, Baggio, Del Piero, Rivaldo, Riquelme were at their peak at the same time and I bet my bottom dollar that Messi will look like a mediocre player. What's more amazing of these great players is that during their era, the rules are not as strict as today (hard tackling was common back then) and yet they managed to overcome this obstacle and showcased their talents and skill. In this era, Messi undoubtedly is the best but he's nowhere near to the standard of the legends of the past. Messi is able to do more with the ball and he is in the right team for his talents. Since he plays deep he has more room to display his ball control, dribbling abilities and passing capacities. He exhibits a healthy, upright and positive attitude and vision in his approach and that makes his case very strong. Portuguese Nani is another footballer who shows good touch and may run close in the race. Others on the FIFA list are eminently gifted and look good for the Ballon d'Or some day. For the football manager of the year honors, young and dynamic Pep and Andre Villa-Boas could be in the running. Ronaldo's career defining goal trumps Messi's. Go watch Ronaldo's goal vs Porto. Messi has never accomplished anything like that. HE broke La Liga's goal scoring record in only 2 years while Messi had 8 years to break it and still hasn't. Even if Messi continues to mesmerize at Barcelona and breaks all existing records in the next 10 years, his not having won a World Cup for Argentina will relegate hisb tanding as the world´s best player ever. That accolade will certainly fall upon the shoulders of players who did their best against their coontrymen, outside their region, then against the world´s best defenders at international matches, and at World Cups. To give an example, Zidane played in the world´s best two leagues when each of the two was the best league. Them he won the Champions League with a goal of such craftmanship that it will never be forgotten. As if to add insult to injuru to any Messi fan, he then scored three goals in two World Cup Finals, at regulation time, the only man other than Pele to do so. Moreover, he invented so many new plays and gave so many incredible assists that his role as a scorer, marginal, really, is not even a matter for discussion. Fuirthermore, tyhere´s sommuch footage of this man for his french team, then for Juventus and finally for Real Madrid, that no matrter how many defenders will be seen being passed by Messi, the fact that Zidane accomplished as much as he did, can not be taken lightly when comparing the tewo careers, that of Messi and Zidane. I am baffled at how many people consider Messi's little "chapeu" of a few months ago as a brilliant goal. A "chapeau", to be really called a work of art, should be done by a player over the entrire head of a defender, so high than even a giant of a defender measuring 10 feet could not avoid. And that goal was excuted by Pele, in the final of the 1958 World Cup and not agaisnt the defebders in his native Brazil, against the then supposeddly world's best defenders, the swedes. For all the commentors blasting Messi's international performances, admittedly he may not have scored a ton of goals or led them to a World Cup win, he still has been one of the best Argentinian players of late. He plays a different role in the Argentinian team than in the Barcelona team. He is more of a playmaker for Argentina, he drops back and creates chances for the rest of the team, not unlike Xavi and Iniesta at Barcelona, thus getting on the scoresheet lesser. Give him a chance, he's still young... one day he may lead Argentina to a World Cup triumph! In the meantime, enjoy his brilliance at Barca... and he is the one and only deserving winner of the Ballon d'Or. Diego Maradona, Pele and Zinedine Zidane all won the WC. In Maradonas case, on his own. There is no question the currently Messi is the best in the world. The question is would he still be if he left Barcelona? Renaldo has proved himself in the EPL and La Liga. What would Messi do in the EPL? LIONEL MESSI – UNDER 20 WORLD CHAMPION (GOLDEN BALL AND GOLDEN SHOE INCLUDED IN THAT COMPETITION). LIONEL MESSI – GOLD MEDAL IN PEKIN 2008 WITH ARGENTINA. LIONEL MESSI – 2ND PLACE IN COPA AMERICA 2007 (HE WAS ONLY 20 YEARS OF AGE, NOT BAD). MARADONA AT 24 YEARS OF AGE HAD ONLY WON THE UNDER 20 WC. – MARADONA NEVER WON A COPA AMERICA OR A GOLD MEDAL IN THE OLYMPICS. WHY DO PEOPLE ALWAYS DO THE SAME?...... CAN'T YOU ALL WAIT UNTIL MESSI RETIRES TO THEN SAY WHO HE WAS IN THE WORLD OF FOOTBALL? MESSI WILL WIN THE GOLDEN BALL BECAUSE HE IS FROM A DIFFERENT PLANTE,... THE SAME PLANET MARADONA AND DISTEFANO CAME FROM... A PLANET CALLED... 'POTRERO ARGENTINO'. messi remain d best player ever, i dont tink any player can context with him bcos messi football is beyoung dis planet, messi is d number 1,2,and3 mayb d nest player can start frm number 4th if u want to know more about messi go and ask alex vandersa formal Man Utd keeper...... Up Messi Barcelona 4life. What's the problem with 90% of brazilian. Nobody can stop Messi. I strongly give the world best player award to the brazilian Neymar.Take a look at national team and club perfomance.I beleive Neymar deserves the ward than Leo messi.Neymar scores from dangerous angles and his dazzling moves justifies him more than any other player on Earth. Messi, is the best player ever.Yes, not all the people 'll have same opinion about him.But he'll continue to give us that mesmerizing magics he does in the pitch.Messi 'll certainly win the Fifa Ballon 'Or award this year, not cos he has no rival but bcos he is from another planet.Critics rem that messi is just a play maker in the Argentina squard that has vitually no defence and good midfielders, so what can he do alone.But I see him do magic again when the team is overhauled in the defence and midfield or Higuain and Di maria become less wasteful. Up Messi!! Messi will surely win ,but he is not great ,barcelona is ,pay atention when barcelona goes bad he also do , barcelona goes well he goes ,he is barcelona dependend , Neymar is a black diamond ,something rare, makes you want to wash football ,just for the love and magic of this sport ,make you dream .Barcelona, messi are good and eficient ,just that ,i wash barcelona no more ,does not amaze me ,they ´re just like chest players cold and strategic ,with some amount of talent ,BUT football is passion ,is unpredictable ,it lies on results ,big money ,never the less it is at the end only a game ,NEYMAR is the mixture of garincha ,péle ,christiano ronaldo and ronaldo ,he is complete .Though young ,19 years old, but poisonous ,lethaly elegant, on a one on one match he will easely beat messi .But what can we do messi has barcelona and neymar only neymar ,thank GOD you were born ,football was becoming boring. The fact that Real madrid is second to Barcelona thus making C Ronaldo not much relevant for the award is baseless.Atleast in the last world cup messi was nobody,but still went ahead to wind the FIFA footballer of the year. When we put so many factors into consideration,I think the award is basically between C Ronaldo and Messi.Both of them make difference in their teams,I think in terms of goal scoring C Ronaldo holds the record, while Messi is a master ball joggler. Messi, Maradona and Pele belong in a class reserved only for the Gods. Platini, Di Stephano, Van Basten, Zidane, Garrincha, Rooney, Pato as well as many others, are in the elite group of the top ten players of all times, but not with the Gods. Xavi and C Ronaldo have been close to entering the hall reserved for Gods. Neymar could touch the doornobs of the hall, if he continues to excel in his game (he is only 19). Messi in time, will surpass all players to become the best of all times. He not only scores the most incredible and beautiful goals, he plays as a 'team player' making every other player in the team excel. He also has a control of the ball and of the game in itself, only surpassed by his teammate Xavi, or as Rock Hudson calls him "Camaleon Eyes". As of today, Messi is breaking all scoring records in Barça, and he has been instrumental in the extraordinary performance of the Catalan giant's dominance of team football. As an after note, HE IS ONLY 24!!!! There's a lot fancy player, why just messi? There's Sneijder, Van Persie, C. Ronaldo,or even Mario Gómez and Mario Götze. As a big fan of the Brazilian Ronaldo, I think messi and C.Ronaldo are not as good as him. The reason? I think you guys have seen their fake "been tackled down" trick. Last week barca almost lost the game, although messi scored a goal, he didn't do well. Their opp should win the game if the ref didn't refuse to give those two obvious penalty. At the same time, Real Madrid have a big win. It's true that pep has some good result when he is in charge of barca, but it's also true that he has a team which is very good at control the ball. Why barca have serious injuries problems this year? because pep tried to use 3 defender strategy, which makes the whole team suffered from busy running. Running is not barca's thing. they like to control the ball and to make space but not to run a lot. Two years ago, mourinho's inter wins the champion league. That year, maybe no one will bet they will win that champion. They did not have very strong team. But they beat barca and Bayern Munich and get the champion. Mourinho showed his vary of strategies under different situations. I don't think pep can make that. I love Real Madrid and also know that Real can never be second best to Barca....NEVER...but...Messi..Messi i Believe! Anyone who is objective about football can see Messi is diffrent from the rest,if you think thats not true ask "Sir Alex...Wenger...or LORD Mourinho"...the kid is just too good!!!! I guess Messi is a best now because Barca makes him the best .But how we can say he is the best or second or third in history of soccer . Do we know how Garrincha played or Di Stefano ... we don't . I hope Xavi will get best player trophy this year . Messi could be best skilled . But he runs average just 5 miles per game when Xavi averages 11-12 miles . Who plays soccer knows what is means when you help defense and attacking players . But Messi mostly just walks and saves his energy for few (yes , excellent ) slaloms per game . Messi is everly world best coz nobody play the way he plays and i want him 2 collect the world 5time back 2 back. When it comes to football we have to analise the skills of the short-listed footballers and undoubtly Leo is the only One. I hope to see Neymar performing in Europe where the championships are more competitive and i hope he will do it better than CR7 does. Yes, undoubtely Messi is great. But whether he will continue to be greatif he does not play in a team like Barca. Let's be honest they are about da greatest team in da world.without Barca Messi can't shine. Check out CR7 he is tested. Man U and now Madrid. Without a doubt, MESSI and PEP are d only men for those awards. C. Ronaldo and Jose will have to wait but it will be to no avail. Messi is aggressive in his approach, not a physical one but a mental one. He gets the ball he runs at people point blank. Its scary that he gets away with it too. Not too much trickery and lucks the sometimes meaningless leg flailing we we see with Rolando. Messi is extremely efficient, in his thoughts and decisions. His is of finding ways to pass through a maze of defenders in extremely high speed. To do it he uses his close control talent, he uses his team mates, and he uses his speed. His low center of gravity also helps him. He uses his right foot better than Maradona and he has a much better header. Yes one can say he plays for the current Barcelona, one of the best teams ever, but I have seen Messi destroy the Nigerian under 20 team, I believe in 2004 or so and I though that guys is a special. That's probably before many of you uttered his name. What Messi lucks is a world cup pedigree. If he wins one, just one and be the best player in it, he will pass Maradona as one of the greats. Although Pele is in a different place than them all because Pele was completely complete. I never seen then and now a more compete player than pele. I never seen a player who use both feet to shoot, to pass, to cross, to dribble and be equally excellent at using both feet. Never have I seen a player like that. And then you add his dribbling, out of this world. Ok if that is not enough add his header. One of the best players ever when it come to using ones head to score goals. If that is not enough add his shots, his free kicks, Hard, swerving, deadly ones. If that is not enough add his speed, power and physical aggression. Pele is great for being so freaking complete. If the Ballon d'Or selection were impartial (which unfortunately it isn't) this year we would be witnessing a very close race between Barça's Messi and Santos' Neymar. Anyone who thinks Neymar isn't worthy of worldwide acclaim simply hasn't been watching the Santos games. The things he's been doing in the past 2 years, it's almost unbelievable to the eye. Kid's a true genius. There is little doubt in my mind that Neymar will win the Ballon d'Or in the future, but unfortunately, since the voting is so biased towards Europeans (when much of the best football in the world is played in Brazil and Argentina) that'll only happen after he signs contract to play in one of the European leagues. What Ballon means for you? thats the question. The best palyer in the world? so Stop the Ballon d Or and give it to him for the next 10 years. The Ballon d'or is an individual price but a team performance price in the same time. A lot of people forgot that. The Ballon d'or has to be the player who perform well, with great attitude and his team need to do very well. When it comes to football we have to Analise the skills of the short-listed footballers and undoubtedly Leo is the only One. In a list of the greatest players ever you must have Brazillian Ronaldo before Zidane. I say this even though I think Zizou is one of the best ever. The world best player should be given to C. Ronaldo for the record he broke in Spain and the part he play in World Cup. His the best for now. I agree this year Messi is by a mile the best but last year look Sneijder champs lg finalist where he literally was Inter mil ans attacking midfield,Seri A Champion with fabulous goals assists, and FINALLY AND THIS IS WHERE SNEIJDER WAS ROBBED world cup joint top scorer and finalist and most influential player in the Netherlands team surely this was daylight robbery just because he was an Inter player. messi is the best &there is no dout about this.and i think hi win bellon d .
I`m Brazilian, but I`m not stupid I have to recognize MESSI is the best ever footballer. Messi didn` t win yet a world cup, but he makes the Barcelona as the best club ever! Let` s stop to be stupid Brazilians, soccer isn` t only here in Brazil , but it is played in whole world! Common! Neymar is a good player , but saying that he can be the best it is a really JOKE! Barcelona has been recognized as the diving capital of the world for the past 4 years. See the cheats on youtube under Hollywood. I like Suarez for this year he showed the world how it should be done by winning the South American tournament. Really ! Messi is a one of the greatest player born in the Earth after Pele ,Diego Mara dona, and Zinedine Guidance. His creation of movement during play is tremendously spell bounding and unbelievable .I belive that only Messi. messi alround world best player of evry season.